That was exciting. That is all the analysis I have. The entire game I was planning this post around another disappointing Nats lose, a lose they couldn’t afford. I was ready to write about how this was yet another game the Nats let slip away although they were never really in it. Ohlendorf started off poorly and ended up allowing four runs on nine hits with no walks and no strikeouts. It was a tough game to watch and one that had many fans switching to Breaking Bad. 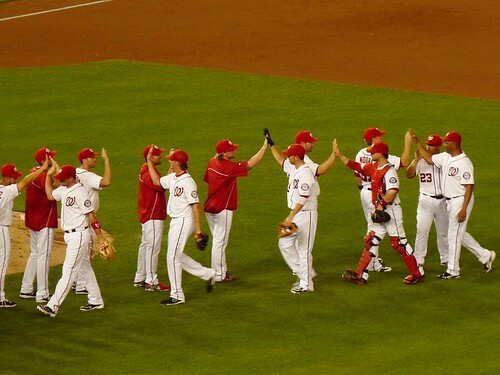 The Nats were able to pull within one in the fourth inning before Ohlendorf allowed his fourth run in the fifth and then their lead expanded to three runs when Krol allowed a run on a single to Eric Young, intentional walk to Satin, and single to Lucas Duda before being pulled for Mattheus in the top of the seventh. Down three runs the Nats were able to get one of them back immediately with a Desmond two out single followed by two wild pitches and a Ramos single to score him from third. That brings us to the bottom of the eighth and where the game really got interesting. The Nats down by two but facing the Mets bullpen. Remember the Mets bullpen? They were in full force tonight. The eighth inning started with the first two runners reaching base which brought Bryce Harper to the plate. Then something curious happened. Harper bunted. It was a decision he made on his own, but it is still a curious one because he is Bryce Harper, but it is less of a curious one when his 2013 .190 and career .222 BA against left handed pitchers is considered. Still Bryce Harper is Bryce Harper and not someone you want bunting, but he also has a career .305 OBP and .378 SLG against left handed pitching. In other words Harper was neither much of a threat to get on base or hit for power. In that regard the bunt makes sense, but it ultimately comes down to the fact that Bryce Harper is Bryce Harper and one of the two best hitters on the team shouldn’t bunt. Now that we’ve examined all sides of the bunt, back to the excitement of the game. After Harper bunted Rendon grounded out to pull the Nats within one and then Zimmerman grounded to the short stop but he was unable to make the play and with two outs Span was running all the way and scored to tie the game. With a runner on first and two outs Jayson Werth came to the plate and he delivered, because of course. That is how this season has gone, Jayson Werth delivers. He was the hottest hitter on the planet in August and if that continues in September with a few other things going the Nats way they may be able to make a chase of this thing after all.